Joint developments within a close collaboration between the MIL-CIMAP team and the Verres & Ceramiques team of Rennes (ISCR-Eq. V&C) were initiated during the ANR "Optique-CO2". Within this collaboration we developed a first optical sensor prototype comprising a mid-IR light source around 4.3 µm based on a Dy3+ doped chalcogenide fiber meeting the requirements established by the BRGM for CO2 detection in geological storage sites. We conducted in-the-field experiments in CO2 storage wells, which have validated the performance of this 4.3µm gas sensor. This allowed us to assess the sensitivity (few ppm) and the selectivity of this first system. Within the ADEME project COPTIK and the CNRS (MI) COPTEX project, we are developing an all-optical gas sensor using the aforementioned Dy3+ doped chalcogenide fiber mid-IR light source to which we add an IR converter based on rare-earth doped fiber in order to convert the IR signal in a near-IR or visible signal. This photon conversion facilitates the transport of the “gas detection” signal through commercial silica fibers enabling the system to be an all-optical remote sensor, therefore insensitive to electromagnetic perturbations. We investigated the development of quantum cutting materials based on rare-earth (RE) codopings such as (Pr3+,Yb3+), (Tb3+,Yb3+), (Ce3+,Tb3+,Yb3+) or (Bi+,Tb3+,Yb3+) in various fluoride single crystals. One of the well-known loss mechanisms in Si solar cells is the thermalization of charge carriers generated by the absorption of high-energy photons. These losses could be reduced by using a rare-earth based luminescent converter to realize the generation of multiple electron–hole pairs per incident photon. Incident photons with energies larger than twice the band-gap of the Si solar cell are absorbed within the converter, which transforms them into two or more lower energy photons by means of energy transfer between rare-earth ions. This process is often called “quantum cutting” which thus aims at the conversion of the high enery part of the solar spectrum (E>2eV) into near-IR light to enhance Si solar cells efficiency and reduce thermalization processes. Promising results were in particular obtained in CaF2 in comparison with other regular matrices since rare-earth ions tend to form clusters in that host. These clusters enable very efficient energy transfers among RE ions and therefore high quantum cutting efficiencies. We identified different types of rare-earth clusters with different energy transfer rates. 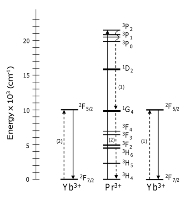 For instance, the highest energy transfer rates were obtained within Pr3+,Yb3+ clusters in which exchange interaction processes take place leading to a 99.94% energy transfer efficiency in Pr3+,Yb3+:CaF2.